← Palm Sunday: What is that all about? Creative Commons Attribution-ShareAlike 3.0 Unported license (Picture source). Yesterday we thought about Jesus riding into Jerusalem. After arriving, the first thing that Jesus did was to go to the temple where he threw out the people who were buying and selling animals there. This episode in the life of Jesus is hard to understand because it seems so out of character for him. Why did Jesus who was usually so restrained act with such aggression on this occasion? You can read the whole of Matthew 21 here. One of the things I mentioned yesterday was that the Jews were expecting Jesus to rescue them from the Romans, but the first thing that he did was to go to the temple. Perhaps that made sense to people who perhaps thought that he was going to pray before taking action. However, people must have been shocked as the calm and peaceful Jesus suddenly began to turn over the tables in the temple courts. In order for a Jew to worship at the temple, they had to sacrifice an animal in order to take away their sin so that they could be made right with God. The people buying and selling in the temple courts were selling animals that people could then use for this purpose. There were also money changers because you needed to change your Roman money into Jewish money which was the only currency used in the temple. Why was this so bad, weren’t these traders helping people to worship? In the UK we have what are known as Motorway service stations and in theory these are great and helpful places. You can stop and you have everything you need, such as shops, restaurants and toilets all in one site. The problem though, is that the food in these places is usually overpriced and it is not always very good quality. The service stations know that they are guaranteed custom from most people once they have stopped and so they are under no pressure to charge fair prices. When a Jew arrived at the temple, they needed an animal to make themselves right with God. The traders knew that the people NEEDED an animal and so they sold their doves at high and inflated prices. The money changers had no incentive to offer a fair exchange rate and so they didn’t. The people coming to worship had no choice, they had to choose between being ripped off and being unable to get to God. Jesus doesn’t criticize the traders for selling, he criticizes them for acting like robbers. What makes all this worse is that the dove was the sacrifice of a poor person. If people couldn’t afford a lamb, they were permitted to bring two doves instead (Leviticus 5.7). 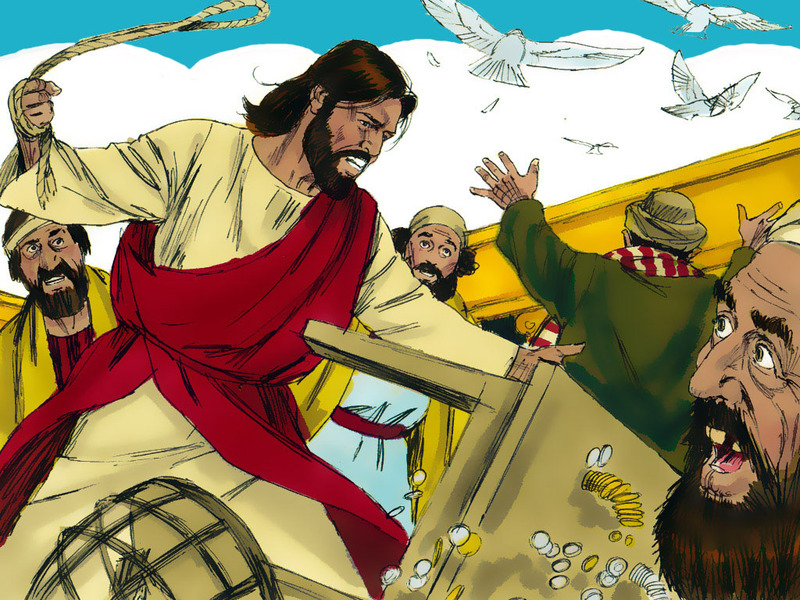 Jesus was angry that people were being ripped off, but he was especially angry that the poor were being exploited. It should be free to get to God. A few days after this, Jesus died on the cross as our perfect sacrifice so that access to God was now open for all without the need for a temple and animal sacrifice (more of that on Friday). Jesus cleansing the temple as this is known leaves me with these four thoughts. We have the real privilege of knowing and following God, but will we? Jesus was furious that poor people were being ripped off. Do we share Jesus’ strength of feeling about this? If we do, how does that affect the way we live and spend our money? Is it important to us when we buy something that we know that people weren’t exploited to provide what we are buying? The Fairtrade label makes this easy for us, buying fairly traded goods is more costly but lets face it, a few pence more for us is better than people being exploited! Will we have the courage to take action over things that are not fair? Jesus took action on this point of principle. How about us? It’s easy to complain about injustice but it’s another thing completely to do something constructive to change things. How can we make a difference today? Will we accept that the problem may not be with everyone else? The Jews thought that Jesus had arrived to sort out the Romans, but instead he was critical of a way of living that had become normal at the centre of Jewish life. If you always think that everyone else is to blame then you are probably wrong! Let’s be open to becoming more aware of our own faults and shortcomings and as we identify them we can then address them in order to move forwards. Palm Sunday: What was that all about? Throughout this week, I’ll be writing a series of blogs called ‘What is it all about?’ that help us to think about the events that led up to Jesus’ death and resurrection. This entry was posted in Bible, Easter week explained, Faith, Holy week, Holy week explained, justice, Relationship with God and tagged cleansing of the temple, don't rip people off, easter week explained, fairtrade, God cares for the poor, God hates injustice, holy week explained, jesus drove out the money changers, justice, matthew 21, motorway service stations overpriced, temple den of robbers, temple den of thieves, why did jesus drive people out of the temple. Bookmark the permalink. 6 Responses to Trashing the Temple Courts: What was that all about? Yesterday we thought about the events of the first Palm Sunday and this is what happened next. Why did Jesus smash tables up in the temple courts?